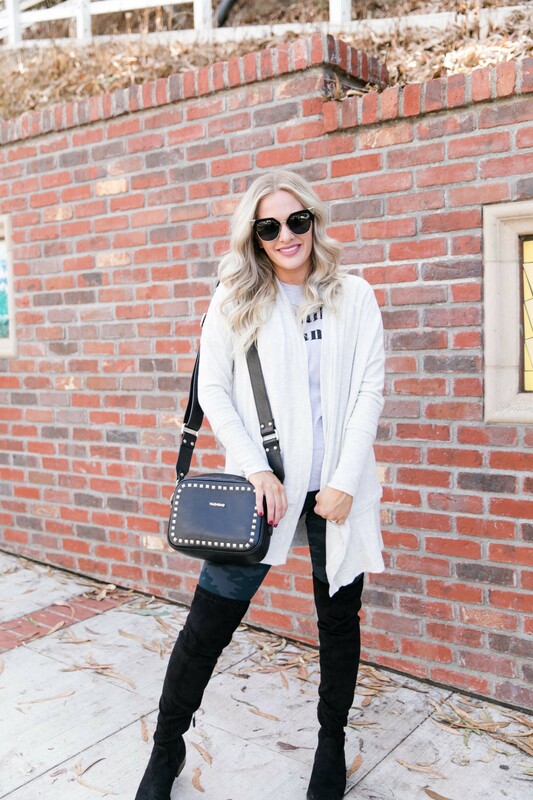 Sharing 3 Easy Ways to Style Suede Over the Knee Boots today! Going to be honest, this post is taking me probably five times as long to write because I am typing with one hand, while standing next to my desk as I hold Nina and bounce her. I am also saying nursery songs to her, and a couple of times have caught myself typing out the lyrics instead of what I actually want to say. Just to paint a picture of how opposite of these photos my life is at the moment! The first way I am sharing to style suede over the knee boots is with this cute little dress! 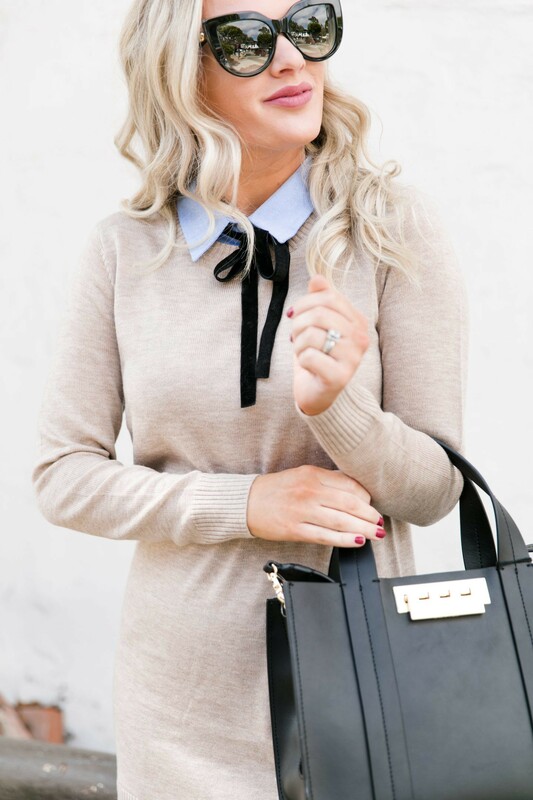 This look is perfection for date night, lunch with friends, girls night, church, or just anytime you want to feel more dressed up during fall and winter. My combo shirt dress is a top seller year and year! Not only is it adorable, but it is such a steal for only $88. This dress has the look of layers, and being more than one piece, but it is only one piece so there is no bulk! I am wearing my prized Stuart Weitzman Over The Knee Boots in this look. Believe me, so worth every single penny!! They never ever sag, and feel sooo good to wear. If you are a boot wearer, then you know those two are huge asks! 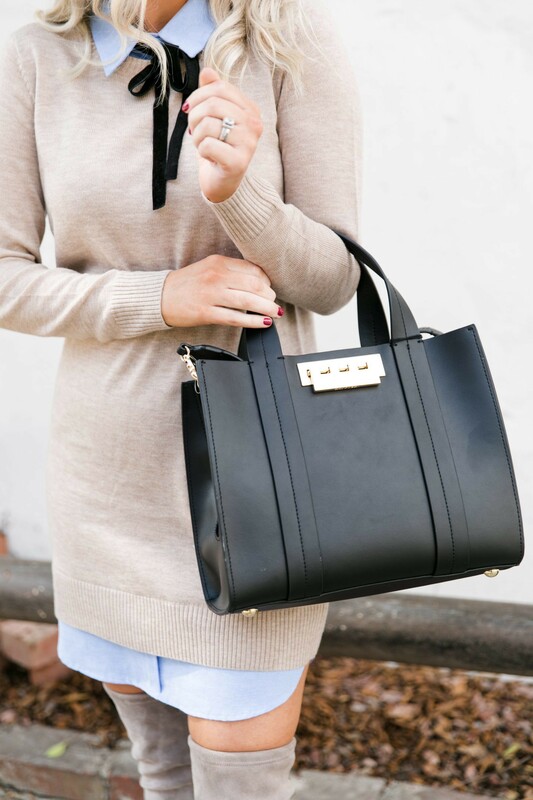 The color I have is taupe, but I do love the classic black as well. I decided to go real life with this second way to style suede over the knee boots! In my everyday life I wear leggings, a tee, and throw on a sweater! I have been a long time firm believer in Spanx Leggings (life changing! ), here I am wearing the camo ones and love them. Staying true to myself I my tee says: Actually I Can, and is a great basic for every lady out there. 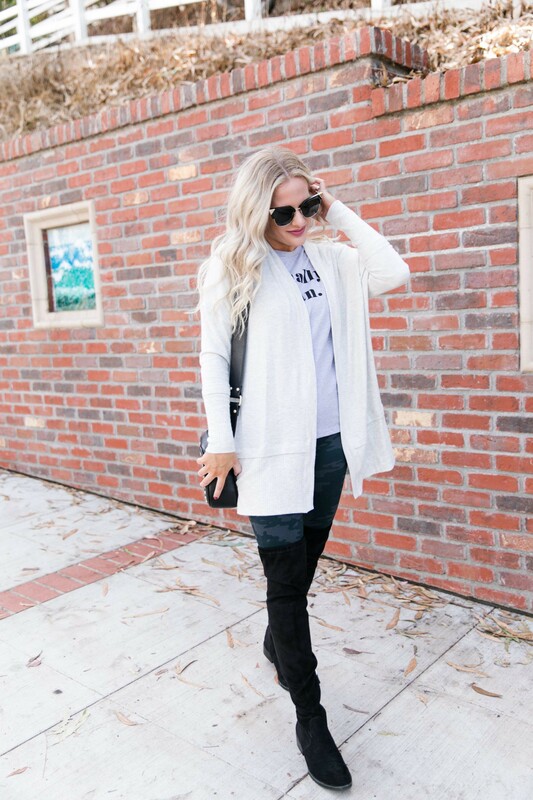 This Three Dots Cardi is literally so soft, I love a good snuggly cardigan and am always so happy when I find one. I am wearing budget friendly black Steve Madden suede Over The Knee Boots that are perfect for the day to day life of mom-ing, errands, and comfort. This last way on how to style suede over the knee boots is sort of an in between of the first two. I like to call it “comfy cute”! For when you want to have a cute day and get dressed, but also want to be comfortable and wear jeans/pants. 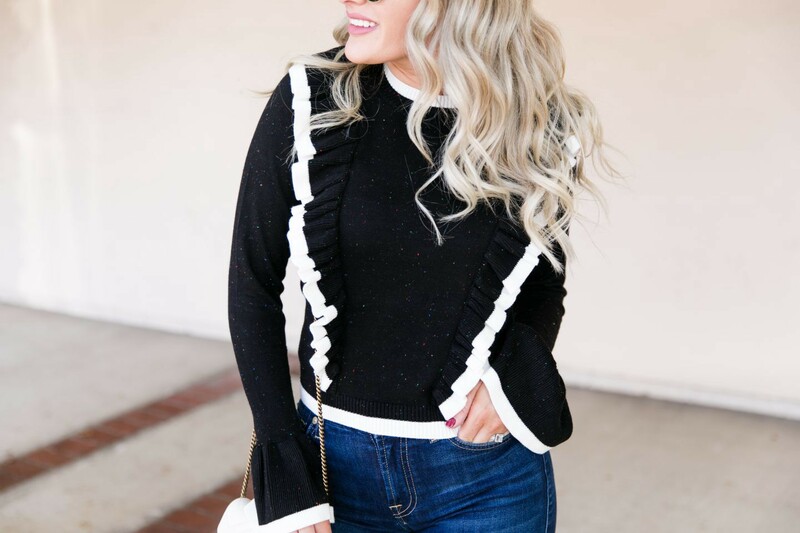 First off, I am obsessed with this cute sweater! It is so hard to see online and in pictures but the yarn, or coloring to it is not solid navy. It is more textured and has some pops of faded red. It really makes it stand out as not your average sweater. Do I even need to mention how much I love the flare sleeves and ruffles?! When I want to be extra comfortable I always throw on my b(air) Denim by 7FAM . 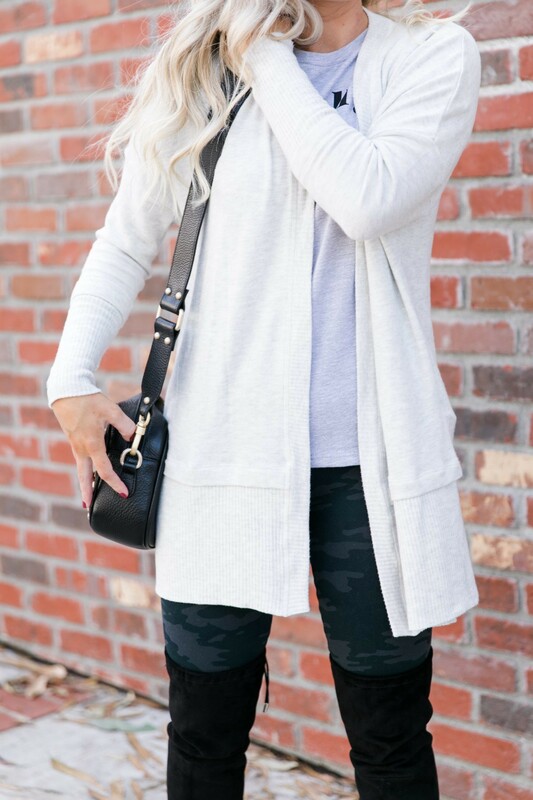 They are super soft skinnies, and perfect for wearing under over the knee boots. These boots are Marc Fisher Over The Knee Boots. They are a good middle ground on price point and quality. I have the grey color. Which suede over the knee boots look do you like best?! Let me know in a comment below! 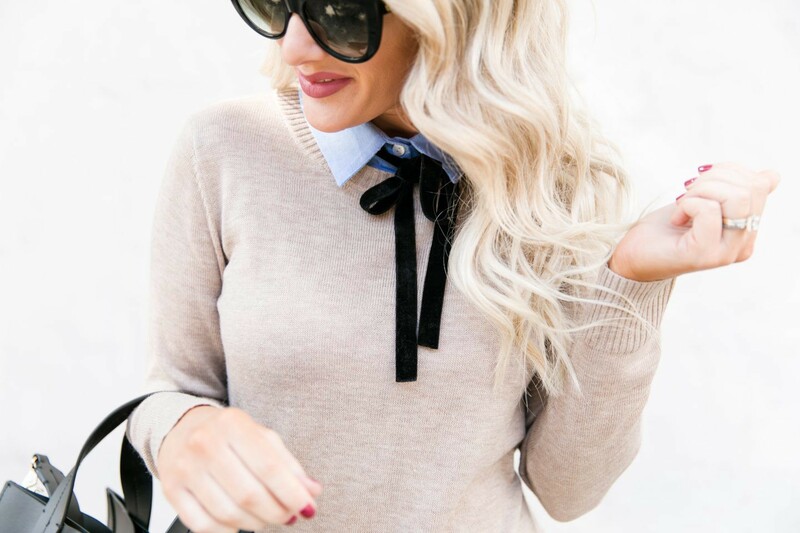 Loving these styling tips? Click here now for more of my favorite styles! !